PRA is an inherited disease of the retina in dogs, in which the eyes are genetically programmed to go blind. This disease can be avoided with the use of DNA testing. Please ensure both parents were tested and at least one is clear. Carriers can only produce affected pups if both parents are carriers or one parent is affected and the other is a carrier. There is no issue with buying a pup who may be a carrier. This will in no way affect the health of the dog. PRA will generally have an onset at 4-7 years of age. The dog will develop night blindness and will eventually become completely blind. It is not painful and most dogs usually cope well if kept in the same environment with the same routine. Familial Nephropathy (FN) or AHRN (Autosomal Hereditary Recessive Nephropathy). This disease is rare but there ARE carriers in Australia and there is a DNA test available for this disease. As with PRA, be sure to ask the breeder if the parents are tested for FN, and at least one parent is clear. There is no treatment for this genetic condition. Puppies typically die in their first year, and up to two years of age. Then there are other forms of kidney disease such as Renal Dysplasia which is very similar to FN. The effects are just as serious and the outcome the same. However, research is underway in Sweden using tissue from affected dogs to find the gene responsible. Hopefully then, a test will be available to determine carriers, and thus eradicate the disease. Do your research carefully, and choose a responsible breeder. Responsible breeders breed foremost for good health and temperament, and if RD, or any other hereditary disease or problems which CANNOT be tested for have appeared in their lines, the dogs involved should be removed from the breeding program. This is not common in Cocker Spaniels these days. Breeding dogs should be hip scored, however Hip Dysplasia is thought to be polygenic - caused by factors including environment and diet as well as genetics, so good hip scores will NOT always guarantee offspring without hip problems. It is very important to follow your breeder’s care sheets and adhere to instructions regarding environment, diet and exercise. Doing so may help avoid joint and bone problems. Lip Fold Dermatitis aka "Cocker Mouth"
Cocker mouths can sometimes become very smelly - as if something crawled in there and died! Check for possible causes such as foreign bodies and teeth problems (pups can be a bit smelly around teething time and this will resolve by itself usually). If there is nothing obvious causing the smell, you need to ensure that the fur is closely trimmed around the mouth. Long fur around the mouth enables food to stick there and cause infection among the lip folds. A natural remedy to fix this problem is to clean in and around the folds of the mouth with apple cider vinegar. Buy the natural form from health food shops and use it neat on a cotton wool swab. Start by cleaning twice a day and then reduce to once a week or so as the smell disappears. Eye conditions such as cherry eye and entropion are also seen occasionally in cockers. Always check the pups for nice tight rims and clear eyes when assessing a litter. A vet check in the days immediately after purchase is recommended. AON is an inherited neurological disorder characterised by a weakness in the hind limbs, eventually leading to weakness in the front limbs. Neurological signs of this condition seem to progress gradually over 3 to 4 years. Clinical signs usually begin between 7 and a half to 9 years of age. These signs include weakening and unsteady hind limbs and uncoordinated movement. The weakness eventually progresses to include the front limbs. When all limbs are affected, there may also be difficulty in swallowing. The disease is described as an autosomal recessive condition and is unique to Cocker Spaniels. This means that a dog must inherit two copies of an abnormal gene (one from its mother and one from its father) before its health is affected. A dog that inherits only one copy of the abnormal gene (from its mother or its father) will have no signs of the disease, but will be a carrier and may pass the gene on to any offspring. If, once your dog is DNA tested, you would like to find out what their DNA test results mean, or how to select the right mate to avoid producing affected puppies, then please read our breeding advice and information on the following link https://bit.ly/2oSbtnn. Below is displayed a selection of suggested diets from Cocker breeders. Be aware that all breeders may not agree on what is the best diet for your dog and that these diets are SUGGESTIONS only. 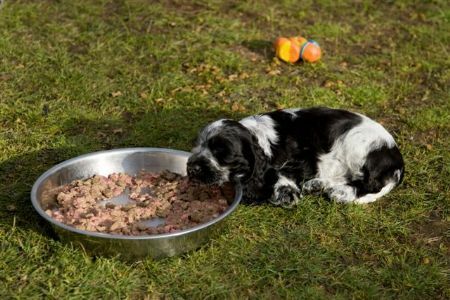 Please take your breeder's advice in regard to feeding your pup, and to avoid stomach upsets it is always best to continue the diet that the pup has been raised on prior to coming home with you. Any changes to the breeder's diet MUST be made gradually and carefully.